Click on a material for more information. 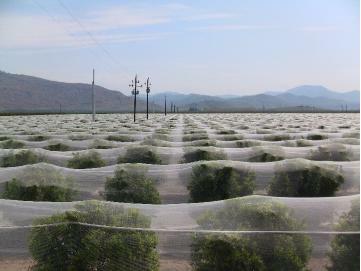 Bee netting is used on mandarins to prevent cross pollination during bloom in order to make them virtually seedless. 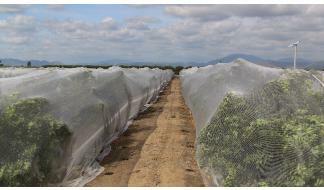 Rolled out between rows of fruit trees, this fabric will reflect sunlight back into the canopy, allowing the fruit to reach maturity faster. Plastic consumer bags for cherries, with PLU number on the side. Styrofoam sleeves protect delicate fruit such as asian pears during shipping. 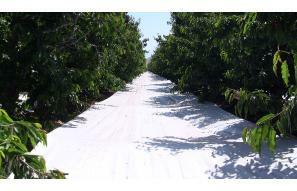 Frost blanket used on sensitive crops or unprotected citrus to prevent frost damage. Phillips Farms offers a wide selection of various ag materials designed to help your produce, from the field, to the packing house. 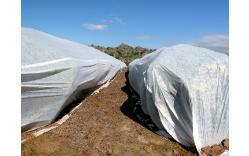 We have bee netting, reflective ground fabric, frost blanket, cherry bags, and styrofoam sleeves. Phillips Farms has a direct partnership with all of the manufacturers of the materials so we can custom order the exact amount that you require. In some cases, we also can provide the service to apply and remove certain materials out in the field, such as bee netting.